How to produce clear and concise contract documents for interior design and construction, along with proven management techniques. The book defines project phases, responsibilities of the parties, scheduling, monitoring the performance of team members, and estimating. Guidance for establishing a successful relationship with a client is also given. 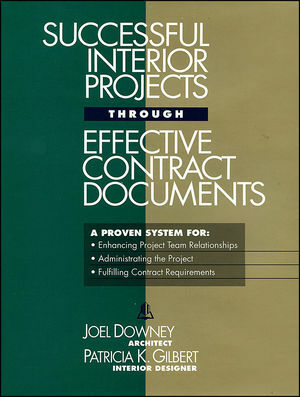 Joel Downey and Patricia K. Gilbert are the authors of Successful Interior Projects Through Effective Contract Documents, published by Wiley. Chapter 1. The Role of the Project manager. Chapter 4. Directing and Controlling the Project. Chapter 5. Working with the Client. Chapter 6. Survey of Existing Conditions. Chapter 7. Construction Budgeting and Estimating. Chapter 8. The Construction Contract. Chapter 9. The Bidding Documents. Chapter 11. Project manual Production.